Charles Perry may be the best heavy-tackle wireman in the world today. Starting out of Oregon Inlet, North Carolina with his father, Captain Charlie Perry when he was six years old, he really caught the fishing bug while on R & R in Australia during the Vietnam War. Perry caught a number of grander black marlin fishing off Cairns on Australia's Great Barrier Reef. 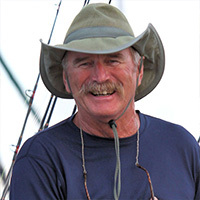 He also fished for 14 years with Bark Garnsey and Stewart Campbell in West Africa. Other stops included the Canary Islands; Madeira; the marlin-rich grounds off St. Thomas; and Bimini and Cat Cay, Bahamas for bluefins.